With the maturity of virtualization technology and service-oriented architecture, single cloud services have been difficult to satisfy cloud users’ increasingly complex demand. Cloud service composition has become a hot topic. Nevertheless, few researches consider the problem of competition of service compositions among multiple users and interaction between the user and the cloud provider. Aiming at this problem, a service composition reservation model of a cloud provider, a cloud broker and multiple users is provided in this paper. A utility function related to revenue, payoff and performance of service compositions is designed and each user expects to maximize it. We consider this optimization problem from the perspective of game theory, and model it as a non-cooperative game. The existence of Nash equilibrium solution of the game is proved and an iterative proximate algorithm (IPA) is proposed to compute it. 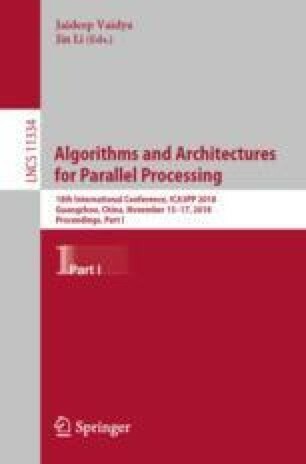 A series of simulation experiments are conducted to verify the theoretical analysis and the performance of IPA algorithm. The results show IPA algorithm quickly converge to a relatively stable state, and improve the utility of the user and the resource utilization of the cloud provider. This work is partially supported by Natural Science Foundation of China (No. 61872129 and No. 61802444) and Doctoral Scientific Research Foundation of Central South University of Forestry and Technology (No. 2016YJ047).